Chapurukha Kusimba, the new chair of AU’s anthropology department, comes to AU from his joint position with the University of Illinois at Chicago and the Field Museum of Natural History. American University has brought in an eclectic mix of new academics for this year. Of the 23 incoming professors (either tenured or on tenure track), AU has attracted talent from fields as varied as anthropology, biology, finance, and literature. The new lineup includes number-crunching economists, neuroscientists, video game designers, and a museum curator. "We're bringing in people who can both teach and mentor, as well as do excellent scholarship," says Phyllis Peres, senior vice provost and dean of academic affairs. Kusimba is the new chair of AU's anthropology department. He has done extensive archeological and ethnological research in the Czech Republic, Kenya, Madagascar, and other countries. 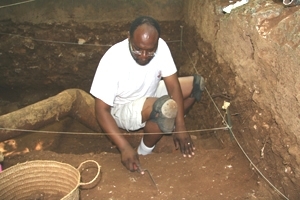 Kusimba comes over from his joint position with the University of Illinois at Chicago and the Field Museum of Natural History, where he was curator of African archeology and ethnology. Kusimba has been studying urban communities around the Indian Ocean at the time of the fall of the Roman Empire and the rise of Islam. Kusimba also studies the history of slavery, which he says existed long before it became institutionalized. He says African children were kidnapped as early as the first century A.D., a reflection of increasing economic inequality. "Why didn't anyone complain about the disappearance of children?" he asks. "Are we seeing the emergence of street children? And when they disappeared, nobody really cared." Kusimba is originally from Kenya and his interest in anthropology brought him to the United States in 1987. "When African nations became independent, anthropology was never incorporated into the curriculum," Kusimba says. "Nationalist leaders thought British anthropologists had played a very important role in aiding colonialism." Kusimba earned his Ph.D. at Bryn Mawr College in the Philadelphia area in 1993, and in taking his new job with AU, he expressed a desire to return to the East Coast. Starting in the penny arcades before morphing into home gaming systems like Atari and Nintendo, video games were often dismissed as mere recreation and leisure for the mindless masses. Not anymore. A number of scholars believe video games provide numerous societal benefits: technological innovation, educational opportunity, and artistic expression. EnterTreanor, a new assistant professor of computer science and a game developer and theorist. As both a creator and thinker, Treanor has been contemplating the potential value of gaming for quite some time. Treanor grew up in the Santa Cruz Mountains in California. He was an early gamer, playing Nintendo games like Super Mario Bros. and The Legend of Zelda. He's also a serious musician who plays both a guitar and a sitar. Treanor traces his desire to design and study video games to his love of art. "Video games excited me because it was a medium where you have the moving image, you have audio, and then you have this crazy thing-interactivity, which people don't really know how to express themselves artistically with," he says. "I thought 'here's the ultimate medium of expression that we aren't really utilizing.'" For college he stayed close to home, attending University of California, Santa Cruz for undergraduate and graduate school. He finished up his Ph.D. in computer science there in 2013. He helped develop the social simulation game Prom Week, which was selected as a finalist for technical excellence at the 2012 Independent Games Festival in San Francisco. Treanor is part of AU's plan to enhance its study of persuasive gaming-a broader discipline than just video games-which can have an impact on education, politics, and business. The other big hire as part of the persuasive gaming push is Lindsay Grace, an associate professor in film and media arts. Grace formerly was a professor of creative arts at Miami University in Ohio. While there, Grace was also director of the Persuasive Play Lab and co-director of the Games Center. He has been a web designer, software developer, and business analyst, among other things. He has a master's in computer information systems from Northwestern University and an M.F.A. in electronic visualization from University of Illinois at Chicago. Runstedtler took a circuitous route to her new job as associate history professor at AU. She's a former dancer and actress from Canada. And she's surely one of the few academics formerly affiliated with the Toronto Raptors dance team. "That was my period of confusion in life," she jokes. She already had her bachelor's degree from York University in Toronto when she entered Ryerson University for radio and television production. But that field failed to grab her interest, and she dropped out of Ryerson. While working for a sports network, she applied to graduate schools and was accepted to Yale. She earned her Ph.D. in African-American studies and history from Yale in 2007, and most recently taught at University at Buffalo (SUNY). Yet Runstedtler hasn't entirely left her old life behind. Her academic research subjects include black transnationalism and anti-colonialism, but also race and gender in popular culture. That led her to write a book about boxer Jack Johnson. "He was literally the first global black celebrity in the early 1900s," she says. "I saw in him an opportunity to talk about racism and imperialism on a global stage." She's now considering new research on Mabel Fairbanks, a trailblazing African-American figure skater. Having figure skated as a child, this is also something Runstedtler can identify with. "That has its own set of racial politics. I think I was the only brown girl in the arena." McGrath, a new assistant professor of education, teaching, and health, has delved into areas with serious, real-world consequences for parents and children. She's conducted research on children with dyslexia, learning disabilities, and speech-language delays. Lately, she's examined how slow processing speed is predictive of both dyslexia and attention deficit hyperactivity disorder (ADHD). McGrath is originally from the Boston area and she earned her undergraduate degree nearby at Brandeis University. She later did graduate work at University of Denver, which had a large sample of twins who had dyslexia and ADHD. Even when they were separated for testing, "you'd see interesting things like identical twins would sometimes make the exact same error," she explains. She also provided therapy for families as part of her clinical training at University of Denver. McGrath was most recently a post-doctoral research fellow in the psychiatric and neurodevelopmental genetics unit with Massachusetts General Hospital, part of Harvard Medical School. Even though many children are diagnosed with developmental disabilities, McGrath sees meaningful progress in her field. "Especially for dyslexia, we have some really good treatments now. There's really no limit on what children can achieve given the right intervention. It's a really hopeful story." Darden, a new associate professor at the School of International Service, has analyzed nationalism and identity politics in Russia and Eurasia. Yet his early awareness of ethnic divisions occurred right outside his front door. Growing up on the South Side of Chicago, Darden was one of the few whites living in a predominately African-American neighborhood. "I think a lot of my interest in ethnic identity comes from that," he says. "We had bricks thrown through our windows…It was the first time I had encountered a kind of impersonal hatred-people that I'd never met before having real hostility towards me. And I've spent a good bit of my scholarly life trying to understand that." Darden earned his Ph.D. in political science from University of California, Berkeley. While in graduate school, he spent months with a tutor in St. Petersburg to learn Russian. Most recently, Darden helped design curriculum for Yale-NUS College in Singapore. In his spare time he climbs mountains, and his far-flung travels have enabled climbing opportunities in Kyrgyzstan and Kazakhstan. Bernhofen grew up in Ulm, Germany, where he got early schooling in mathematical economics. Over time, his research became more policy-oriented and he earned his Ph.D. in economics from the Maxwell School of Citizenship and Public Affairs at Syracuse University. "I like philosophy and I like to talk about social issues, and I like applying mathematics to understanding social problems," he says. He taught at Clark University in Massachusetts before spending the past eight years with University of Nottingham in the United Kingdom. He deals with international economics and is now a professor at AU's School of International Service. Mathy is a new assistant professor of economics. Mathy's father has been a French and French literature professor at University of Illinois at Urbana-Champaign, and Gabe grew up in the college town. He eventually earned his undergraduate degree there, but he gravitated away from languages and towards numbers. "It gets a little inbred if you have work that's too close, so it's good to have a little bit of distance," Mathy jokes. Mathy recently finished his doctorate from University of California, Davis, and he wrote his dissertation on the Great Depression. "I was in graduate school when the [2008 financial] crisis hit, so I was sort of a child of the Great Recession. So that's why I got interested in looking at the Great Depression-to try to learn more about the current crisis and what was happening in the world around me," he says. Giraudy was born in Buenos Aires, Argentina under a dictatorship, which forced her family to relocate to Patagonia in the southern area of the country. Though Giraudy has no recollection of this, she became fascinated by anti-democratic governance. Fast forward to today and Giraudy is finishing her book on undemocratic regimes at the subnational level (states and provinces) within democratic nations. "The research question I address is 'why is it that national democracy does not trickle down evenly to subnational levels in government?'" She analyzes this phenomenon in Mexico and her native Argentina. Giraudy earned her Ph.D. from University of North Carolina (Chapel Hill). Most recently, Giraudy did post-doctoral work at the Harvard Academy for International and Area Studies. She is now an assistant professor of comparative and regional studies at AU. When Giraudy's off campus, her two young daughters keep her quite busy. Nelson Amaral, an assistant professor of marketing, earned his Ph.D. in business administration from the University of Minnesota. Llezlie Green Coleman previously worked in private practice, representing plaintiffs alleging credit and employment discrimination. She's now an assistant professor of law. Jennifer Daskal is a new assistant professor of law. She's worked in the Department of Justice and was senior counterterrorism counsel with Human Rights Watch. Jonathan Fox is a former chair of the Latin American and Latino Studies Department at the University of California at Santa Cruz. A political scientist by training, he's now a professor at the School of International Service. Jeffrey Harris is a professor of finance and a former dean's chair in finance at Syracuse University. Naden Krogan, an assistant professor of biology, recently did post-doctoral research in the Plant Molecular and Cellular Biology Laboratory at the Salk Institute for Biological Studies in California. Nathan Larson, an assistant professor of economics, has specialized in auctions and social learning. He previously taught at the University of Virginia. Andrew Lih, an associate professor of journalism, was formerly with the Annenberg School for Communication and Journalism at the University of Southern California. Mark Niles, professor of law, has returned to AUWCL after serving as dean and professor of law at the Seattle University School of Law from 2010-2013. Todd Prono is a former financial economist at the Commodity Futures Trading Commission. He's now an assistant professor of finance and real estate. Malini Ranganathan has researched political ecology and global metropolitan governance. She's a new assistant professor of global environmental politics. Kathleen Smith, who has lectured at New York University, is a new assistant professor of literature. Her research interests include the literature of social unrest and medieval literary theory. Elke Stockreiter is a new assistant professor of history, with an interest in African social history and Islamic studies. She's a former professor at the University of Iowa. Bei Xiao has a Ph.D. in neuroscience from University of Pennsylvania and did post-doctoral work at Massachusetts Institute of Technology. She's a new assistant professor of computer science.